Sylva Nze Ifedigbo, fiction writer and op-ed columnist, was born in 1984 and lives in Lagos Nigeria. His works of fiction and socio-political commentaries have appeared in many publications both online and in print, including Prick of the Spindle, African Writer, Maple Tree Literary Supplement, Saraba, Kalahari Review, True Africa, and AFREADA. Spectrum Books published his novella, Whispering Aloud, in 2007 while DADA Books published his collection of short stories, The Funeral Did Not End, in 2012. 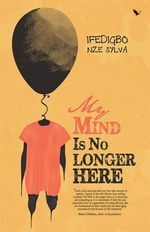 My Mind Is No Longer Here is his debut Novel.